1. 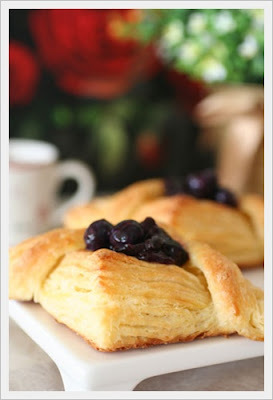 Mix the milk and eggs, then refrigerate the mixture and flour for 1 hour before mixing the dough. 2. Shape the unsalted butter into 5” square and place in the refrigerator. 3. Dissolve the yeast in the milk and eggs mixture. Stir in the sugar and salt. Reserve a handful of flour and mix the remainder. 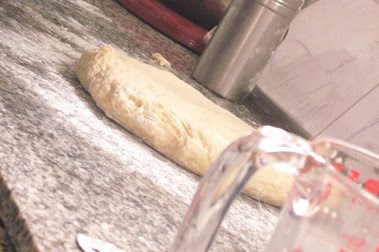 Add enough of the flour to make a soft and sticky dough. 4. 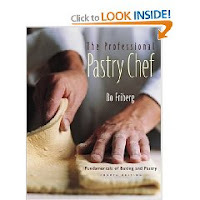 Place the dough on the floured surface and shape into a 7’ square. 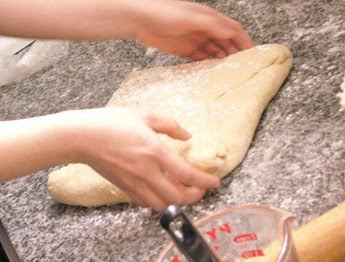 Place the chilled butter square diagonally on the dough so that the 4 dough triangles are showing. Fold in the triangles toward the center and seal in the butter. 5. 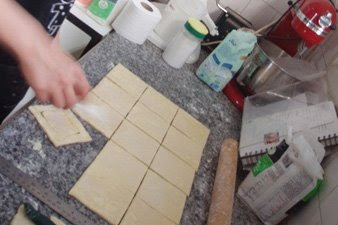 Roll the dough as carefully and evenly as possible into a rectangle measuring 30x20cm use plenty flour to prevent the dough from sticking to the table and rolling pin. 6. Give the dough a single turn. Cover and refrigerate 30 minutes (or 1 hour). 7. 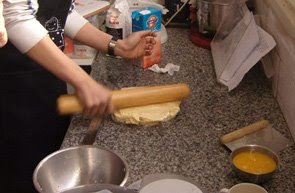 Roll the dough to the same size as before and make 3 additional single turns, resting the dough in the refrigerator for 30 minutes (or 1 hour). 8. Roll the dough to about ½ inch thick, cover with plastic warp and place in the refrigerator or freezer depending on how hot the room is. The dough should chill at least 30 minutes. 9. 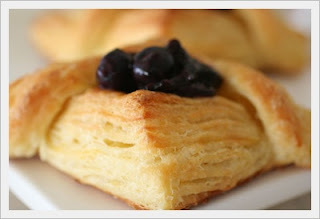 Make the Danish according to the individual recipes and let the pieces rise until slightly less than doubled in volume. 10. Bake at 220°c for 12-15 minutes.